We didn’t have a color scheme- rather every color imaginable! If I were to give it a description it would have to be “a Mexican Fiesta in a barn”. Our family friend is an events coordinator and so she helped us pull it together on the day. We spent many hours making our own decorations, including: cutting and gluing 1200 colored ribbons to make the chair decorations as well as emptying 60 cans of a limited edition “Andy Warhol’ Campbells soup can to serve as flower holders for the table. 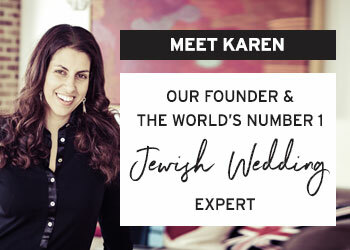 I researched a specific style and came across a designer in Melbourne who makes crocheted wedding dresses. It was a unique dress but still elegant and absolutely beautiful. 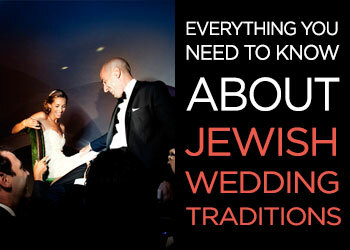 I got it made which meant quite a few trips back and forth to Melbourne but I loved the whole process. I had planned to wear my great grandmother’s earrings on the day, her name was Lottie and as soon as I became aware that this dress by Jane Hill, was named “the Lottie” it really reinforced that this dress was ‘the one’. Along with the earrings from my great grandmother, I wore a colourful, bold Shourouk cuff. I wore a veil from the same designer that was taken off after the ceremony but I knew that I wanted to wear something fun in my hair. As I had worn flowers in my hair for our engagement party, I decided to try something different but still colourful and so I had a whole lot of brightly coloured pom poms in different sizes on wire threaded into my hair, creating a pom pom crown. I feel that this allowed me to feel like a bride but still be true to my colour loving self. Many people expected me to wear a colourful wedding dress but I still wanted to feel elegant in white, so this touch of colour worked well. 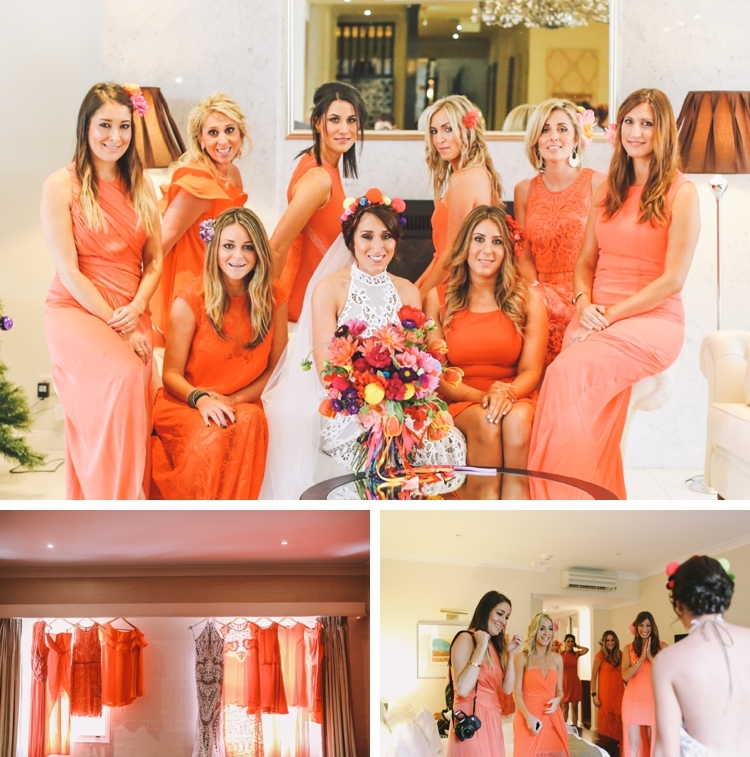 I knew I wanted orange shoes to match my orange bridesmaids and I found a pair in Melbourne after a wedding dress fitting. They were very supportive and comfortable with a raffia heel and base and orange leather. There were a few moments during the day where the heels came off and the gumboots came on to get through some muddy spots on the farm for photos. Cassie Mendoza-Jones was amazing with my makeup. I wanted to be myself but feel glamorous — not over the top but not too natural. My hair was by Jessica of DD&CO. I knew that I wanted to have my hair tied back in milkmaid braids as my dress was completely backless. Tony wore a blue suit, white shirt and crocheted orange tie by Patrick Johnson with lace up brown brogues by Clarks. IThe first time Tony and I met, I wore a giant green crayon in my hair — it was a hair clip I had made at the time. We always refer to this moment and Tony says it was that crayon in my hair that caught his attention and thought, “Who is that girl with the green crayon”. 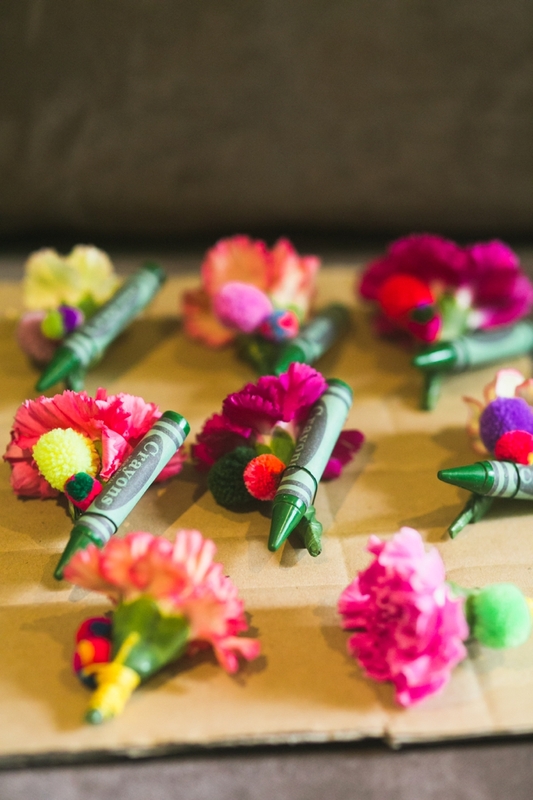 decided that as a surprise, I would make Tony, his groomsman and his father, green crayon boutonnià¨res. I made them out of resin and polished them so that they actually looked like a real shiny wax crayon. 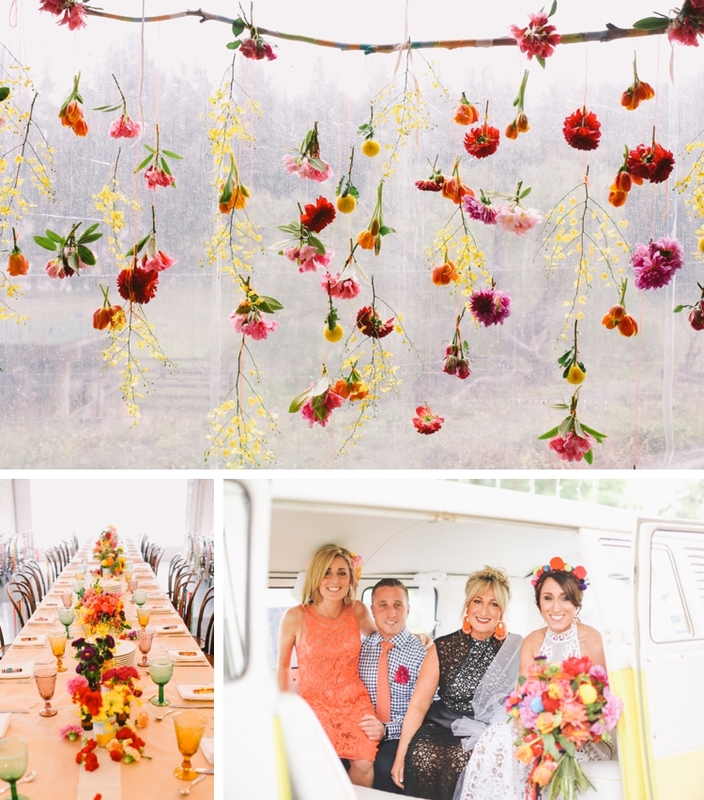 I then sent them to the florist with some brightly coloured mini pom poms and the result was amazing! 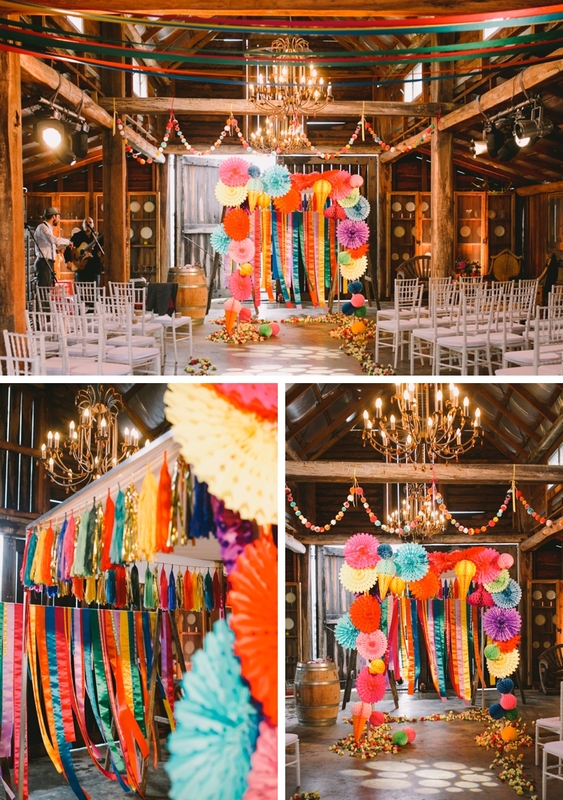 The flower was beautifully intertwined alongside the crayon and the addition of the tiny pom poms tied in nicely with not only my head piece but the overall collection of colour and pom pom garlands around the barn. Not to forget the pom poms that were included in my bouquet! 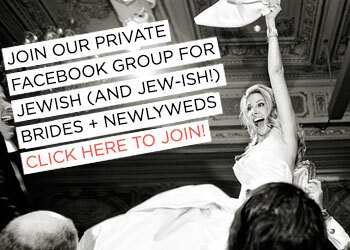 I had 8 bridesmaids — my sister, my cousin and 6 friends. 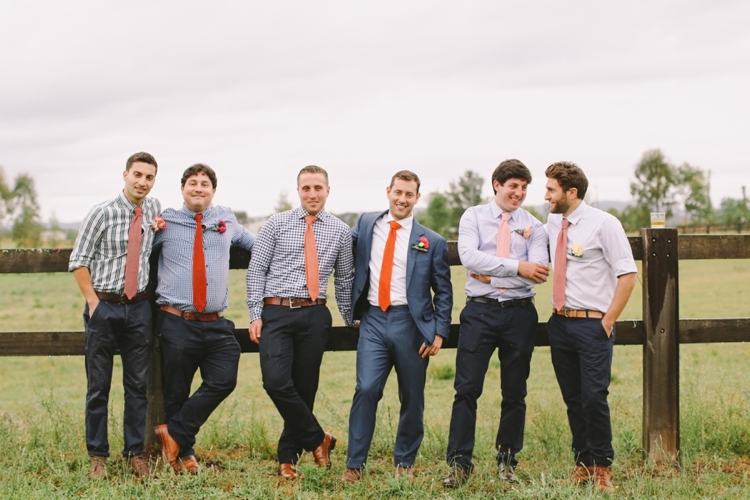 I wanted them to wear anything they liked in dark orange or tangerine. I wanted them to feel individual, not in a uniform and be able to express their own sense of style in a dress that suited their body shape. The result was amazing — they all looked gorgeous and each wore a flower in their hair to tie them together. Instead of a bouquet flowers for each, I got my bridesmaids to carry a big foil heart shaped balloon with tissue paper tassels. 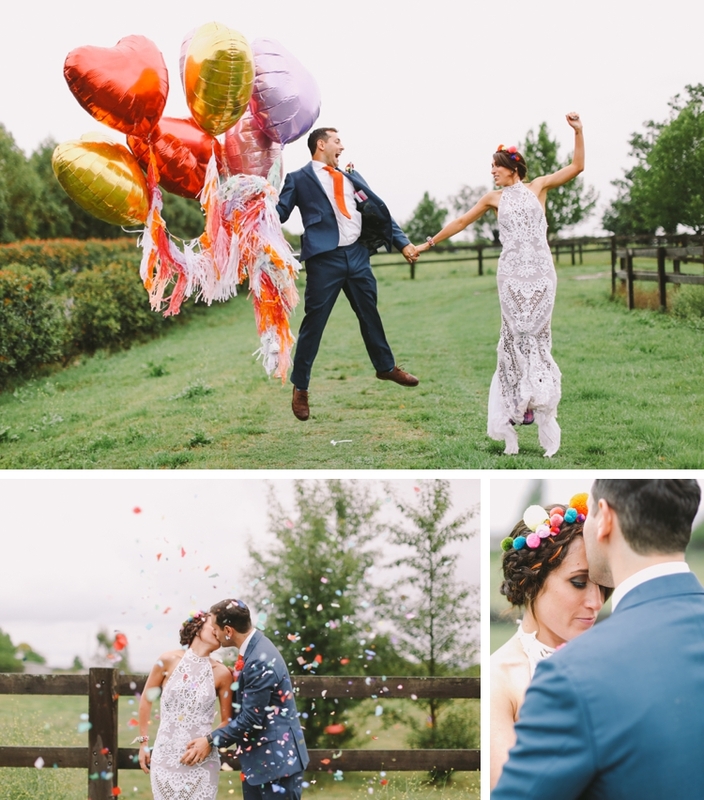 It was so much fun having the balloons for the photos and a little out of the ordinary touch that tied in well when the girls walked down the aisle and stood beside the chuppah. The song I walked down the aisle to, and circled Tony 7 times was ‘Wait’ by M83 — it is the most emotional and beautiful song. 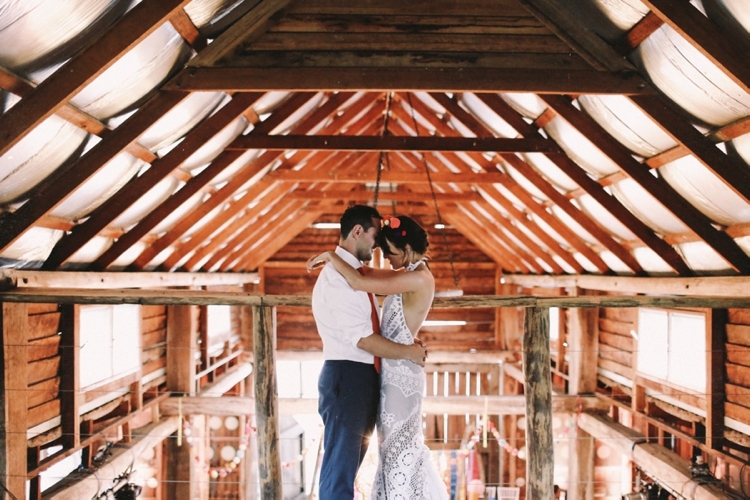 The lighting in the barn against the incredible colours together with this song playing was truly magical… many people have said it felt like a music video clip. It was so powerful yet so beautiful. Seeing Tony so emotional as he walked towards me during the Badeken just before walking down the aisle was also a beautiful moment shared with our close family and friends. 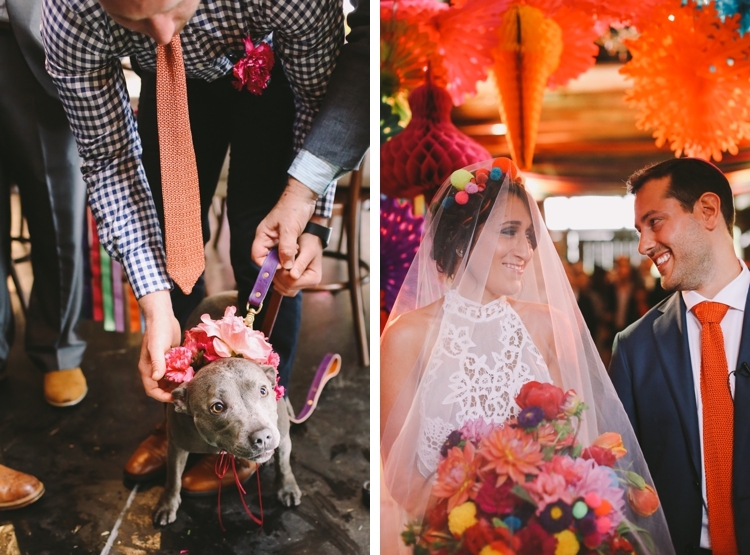 We had my brother’s blue staffie, Nala, walk down the aisle with us — and although she was a little overwhelmed and began breathing quite heavily over the Rabbi’s talk, acting like it was her wedding day, it was so lovely having her with us for that time. 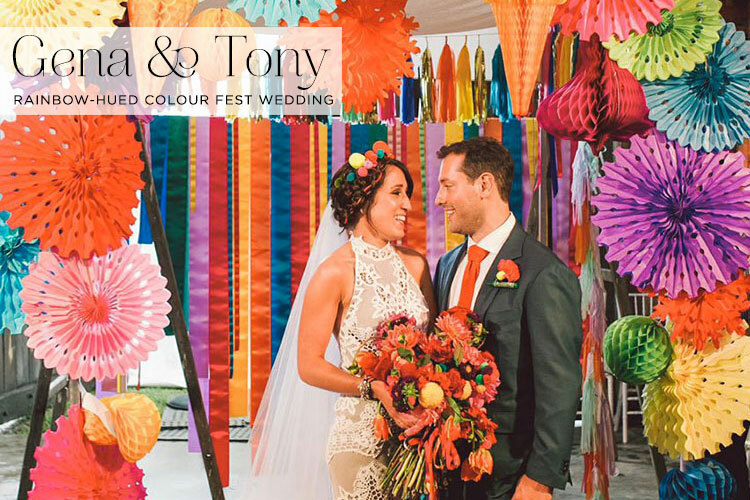 They say the chuppah represents the home you will build together so it was only fitting that ours would be a colourful space. I just wanted to have something quirky but still traditional and the result was like a sculptural installation and a work of art. 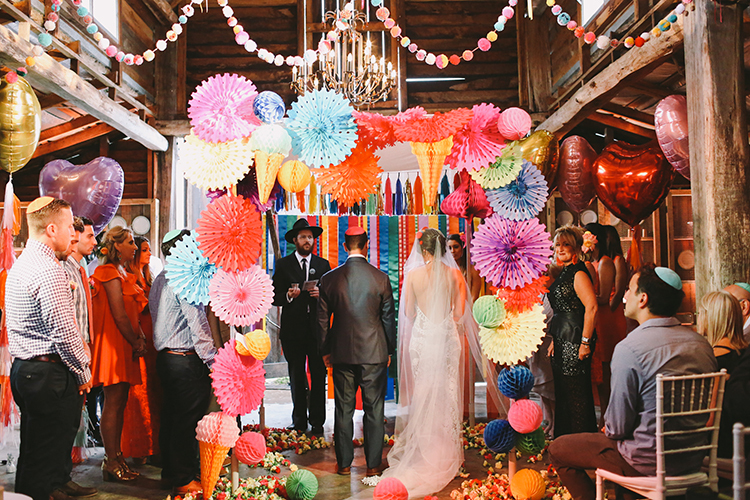 We used an assortment of tissue paper honeycomb shapes (including ice creams) as well as tissue paper garlands and a calico roof. Our fabulous florists were called The Sisters and they created the most beautiful sculptural floral creations. I wanted to have a very low collection of flowers down the centre of the long tables as to not block off ones view. The florists did this beautifully and scattered the rest of my pom poms, a little bit of glitter confetti, candles and a few stems in bottles and Campbell soup cans to fill the space. We also decided to have some hanging/floating flowers down the side of the marquee, as well as some floral garlands in the barn. It was all done so tastefully and I couldn’t have been happier. When I saw my bouquet on the morning of wedding I actually squealed with joy. 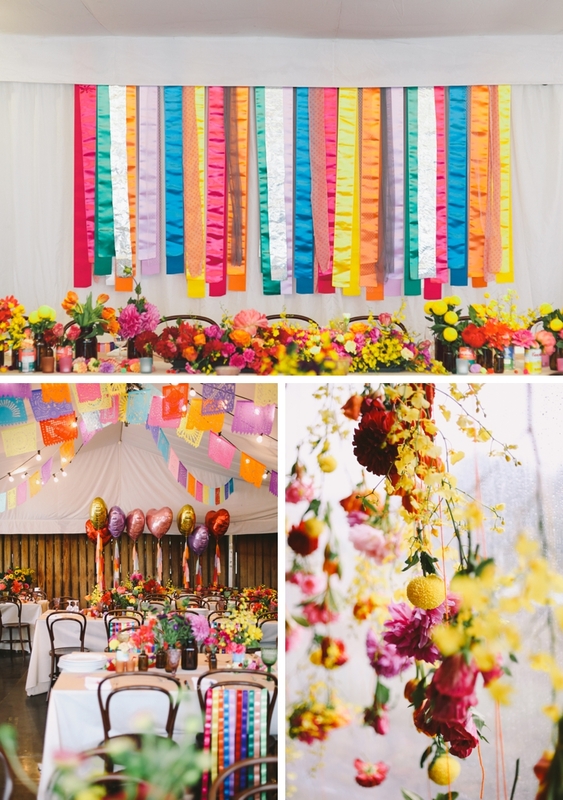 It was perfect and contained every bold and bright flower I had wanted together with left over ribbons from the chair decorations tied onto the bottom and lastly some pom poms on wire popping out amongst the flowers. 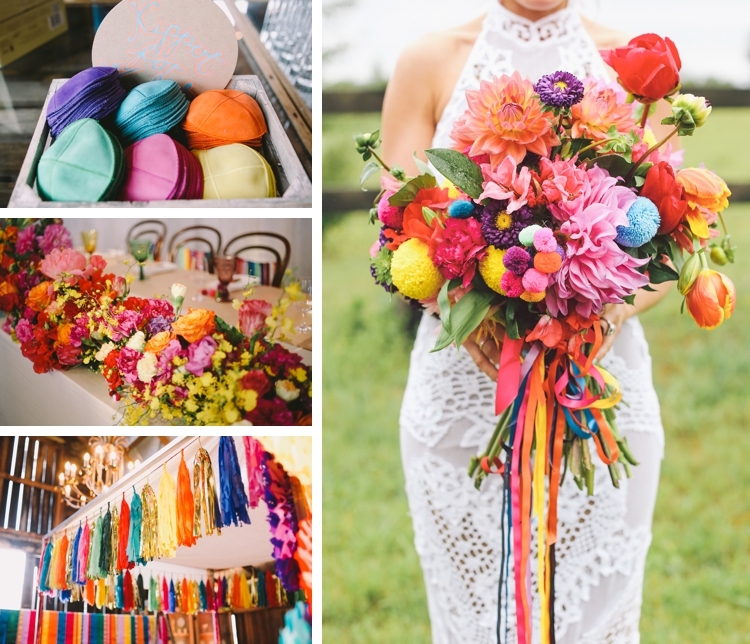 All in all, an explosion of colour, a fiesta of flowers! 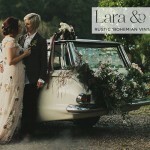 We pretty much planned our wedding around Lara Hotz’ availability! We have known her for years and I always knew that when I got married she was the person I wanted to capture my day. She is a very talented photographer and I knew she would be able to work well in such a unique space. We also used some amazing videographers called The White Tree. 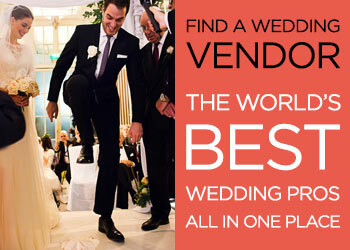 They were so professional and great to work with, capturing the day beautifully. We decided not to have a wedding cake but for dessert had a giant chocolate cake constructed in front of the guests while they partied on the dance floor. We then had fruit popsicles and nutella crepes being served. The main course was quite a relaxed menu with lots of shared plates and hot chips going around. We chose not to have a first dance but rather we dedicated a song to my dad who passed away when I was younger. 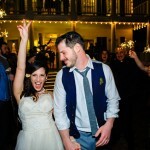 I have memories of him listening to ‘I wonder’ by Rodriguez, so we got the band to learn this song and invited everyone onto the dance floor to enjoy the moment together. We absolutely loved the band that played, Furnace & the Fundamentals. We saw them play at a bar and knew they would be incredible. 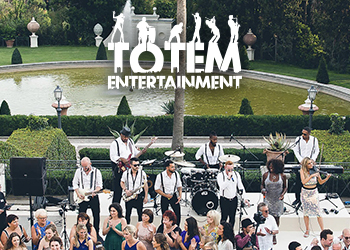 They had amazing energy, songs and dance moves that kept everyone dancing alongside. Upon arrival we had little brown bags filled with roasted almonds for guests to snack on while waiting for the ceremony to start. We also had brown paper rather than a tablecloth and each guest had three coloured crayons that tied the napkin together. 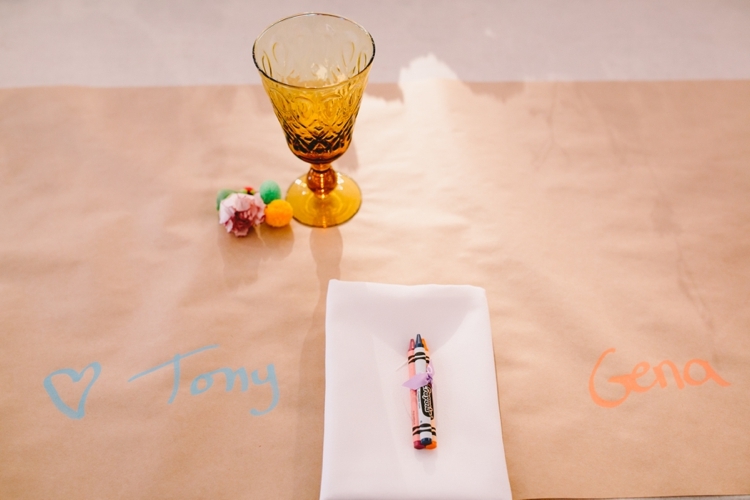 This not only tied in the ‘green crayon’ idea of when Tony and I first met but also reinforced my love for art (I studied drawing and painting) as well as Tony and my intention to make this wedding fun, relaxed and unique. The idea was to let guests scribble messages, pictures and just have a bit of a play while seated. 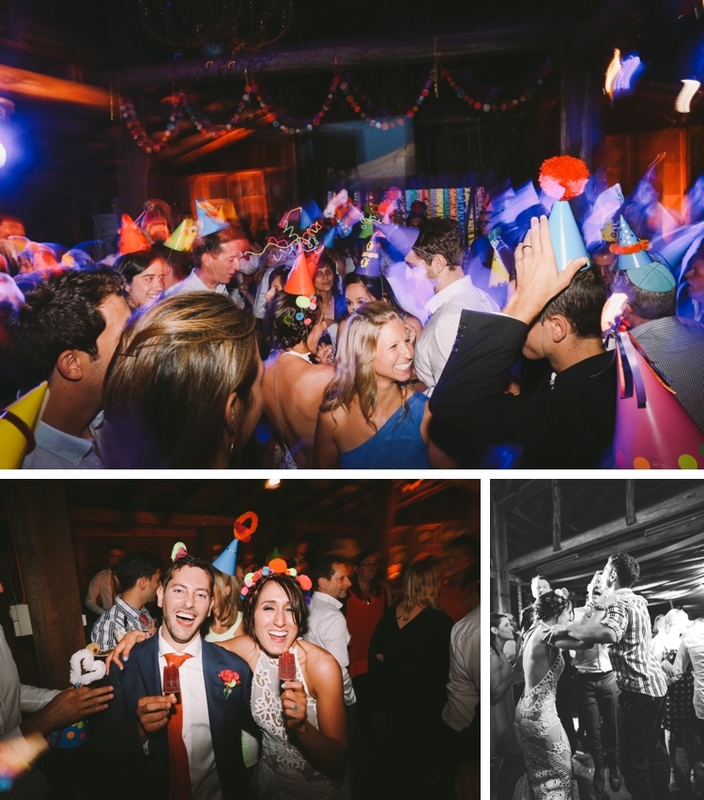 I loved seeing the guests dancing together wearing the party hats which I made with some friends in the lead up to the day as well as knowing we had put together an amazing party that both Tony and I had worked so hard to achieve. 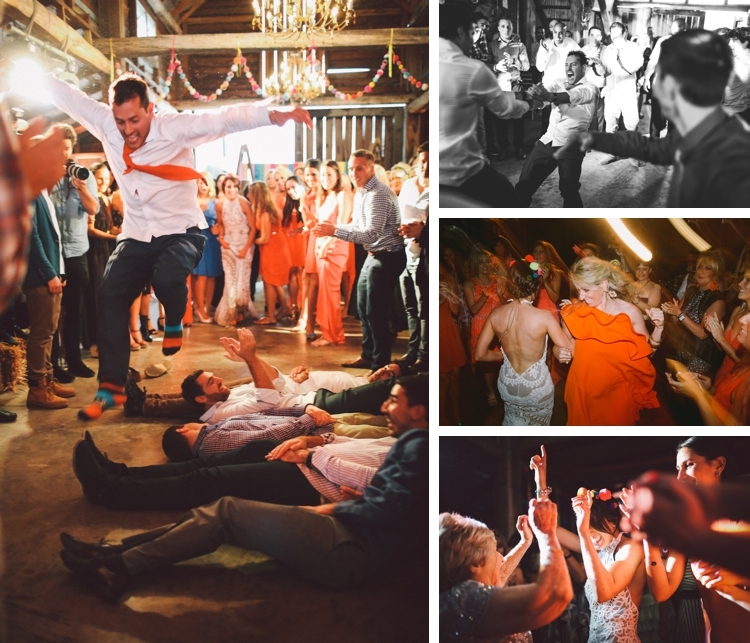 Knowing that this fun party was our wedding was an incredible feeling. Don’t let the things you cannot control affect you! Like the rain! 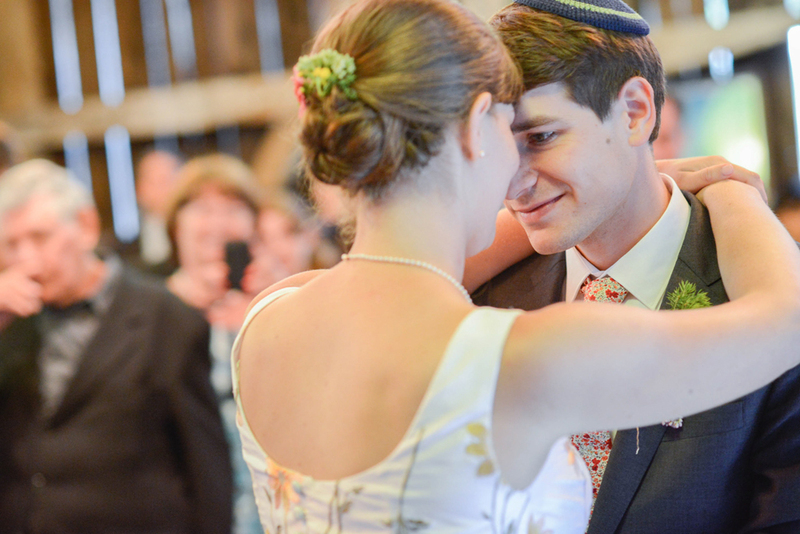 Often things end up being even more magical — like the last minute decision to have the chuppah inside the barn because of such rain. Although I had visualised walking out the barn and down the aisle, having it inside under the lighting was just beautiful and intimate. 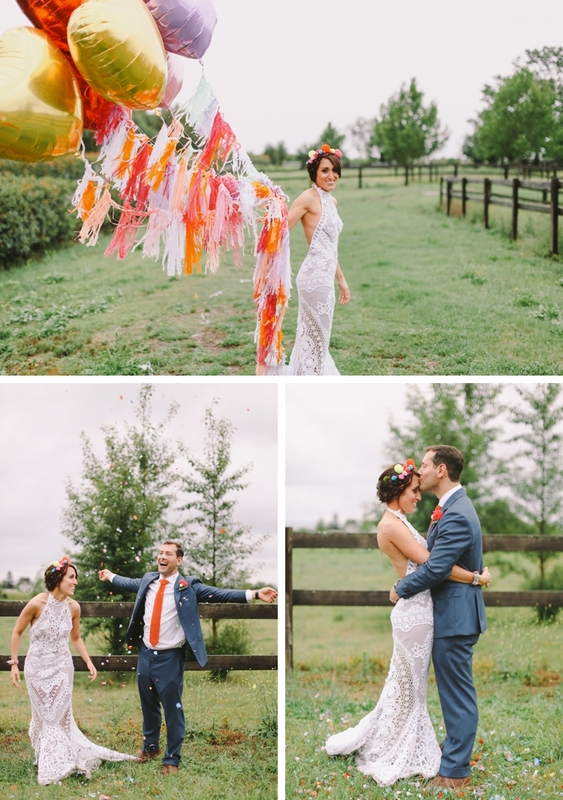 This is a truly stunning couple and absolutely gorgeous wedding! What a visual treat, and super creative! 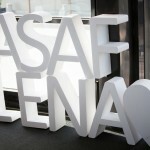 Loved viewing all the wonderful photos and reading about their exciting creative process! You got it Gaby. It’s just an absolute treat all round. isn’t it.. 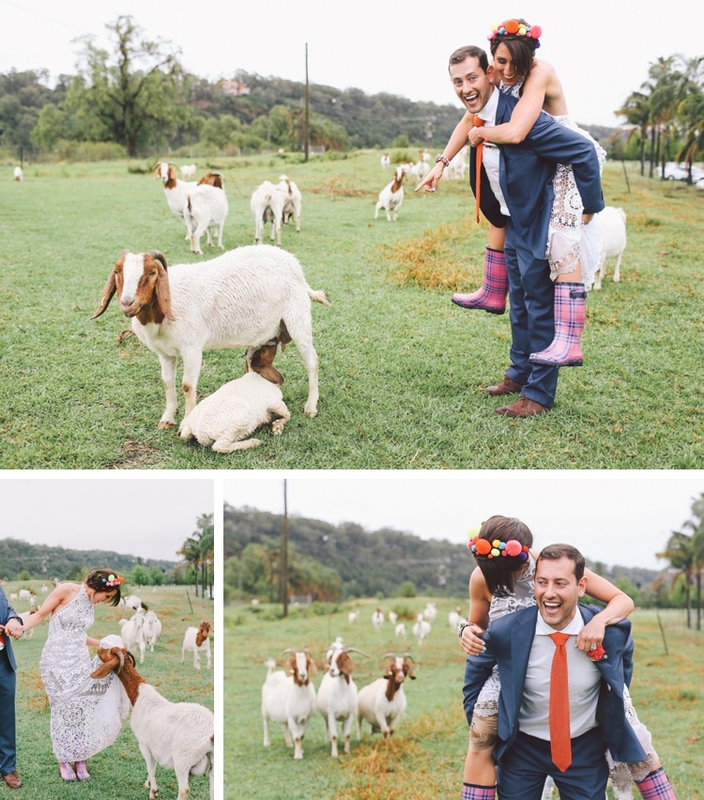 I am literally obsessed with this wedding – I can’t get enough of it! Look at all that colour! LOVE!! Amazing wedding, gorgeous couple, love it all! What the heck. That is pure awesomeness. 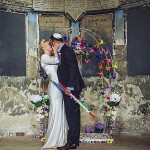 Lovely photography and wedding! 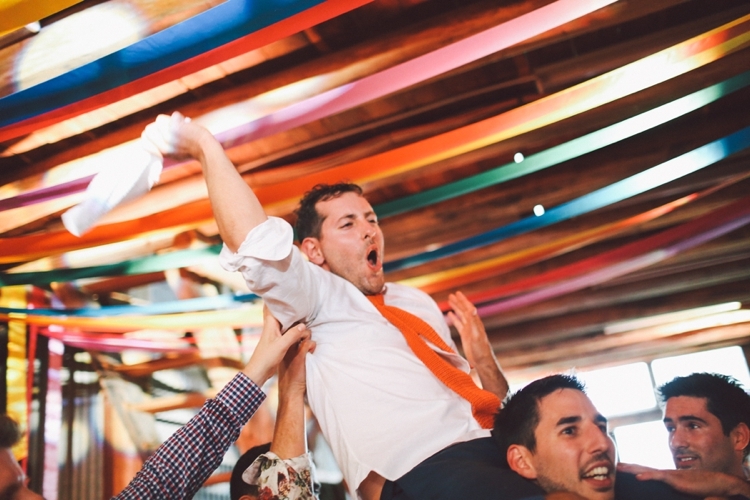 WOW – what an awesome and vibrant wedding! 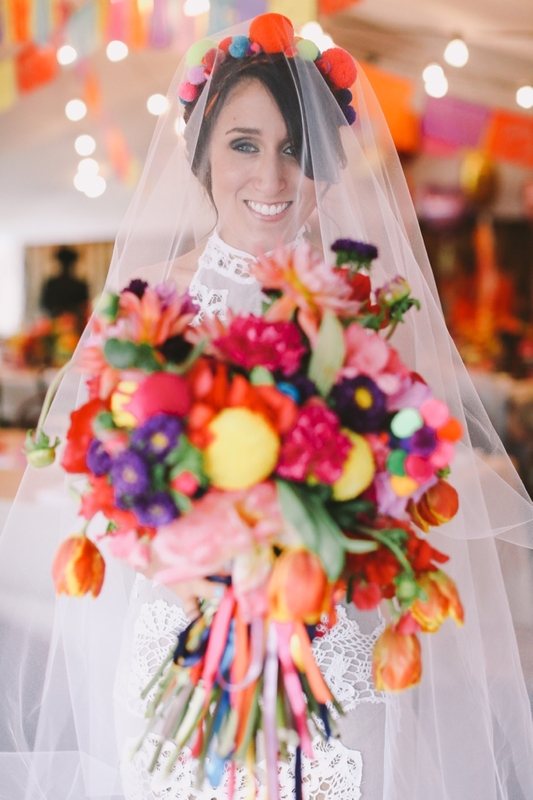 The bride’s dress is beyond beautiful and I love the use of flowers and colour through out – a wonderful celebration!